Home Articles Is PowerPoint a Strategic Tool? PowerPoint was born in 1984, when Microsoft released its first version in black and white. Since then it has become an integral part of the daily lives of our companies and schools. As of this writing, over 30 million presentations are being made every day. Edward Tufte published an article in Wired magazine entitled, “PowerPoint is Evil,” in which he wrote that the software is a kind of magic pill that should make people more beautiful but instead makes them more stupid! An anti-PowerPoint political party was actually founded in Switzerland. Who hasn’t heard the expression, “double-edged sword”? Well that’s exactly how PowerPoint should be viewed. SOAP has already forgiven this software for its shortcomings and the poor performance with which it is known to be associated. You can learn here why we forgave it. In the U.S., a student at the University of Arizona conducted a test with three groups. He showed all three groups the same statistical data, but in different formats. The first group gave the presentation a 4.5 grade. The second gave it a 5. And the third gave it a 6.5. Meaning that group three was the one that better understood the information the student was attempting to convey. The difference was that for group 1 the data was shown in a table in a Word document. Group 2 saw the same data, but in a chart. The third group saw the same chart, but in a PowerPoint with animations that emphasized the key information. Which tells us that a well-designed chart with a helpful animation in PPT can help you convey your message. Most agree that the biggest challenge in business today is capturing attention. Either internally or externally, people in businesses argue for attention, budgets, products and ideas. But where does PowerPoint stand here? In 2010, Sarah Kaplan, of the University of Toronto, published an article entitled, Strategy and PowerPoint, in which she argued that PowerPoint can help its users to get their message across more effectively. And this is what SOAP, since 2003, has been defending: PowerPoint is a strategic ally that can help executives to discuss and disseminate important ideas. PowerPoint facilitates collaboration. Well-designed slides presented in strategic meetings can direct thoughts and lead to consensus. PowerPoint makes an idea “real.” When expressed in a visual manner, information has much more of a chance to reach the minds and hearts of an audience. PowerPoint leads reasoning. Generally, to achieve consensus executives use PowerPoint to explain ideas and engage people. When used in the right way, the software can help an audience to cling to an idea or project. And these three roles are exactly what SOAP has been advocating since day-one! 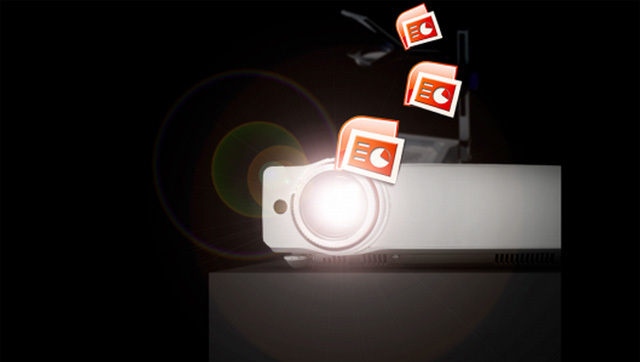 Do you still need more reasons to use PowerPoint? With all this, we’re not advocating the use of this software in just any situation. We agree that for some occasions it’s clearly not necessary! But for others it can be a great help. A visually well-designed presentation greatly facilitates audience understanding. The memory of an interesting presentation is retained by an audience. We think through images. When we read a novel, we imagine each scene. When we watch a PowerPoint presentation, if there are no visuals on the slides we tend to represent the ideas in terms of our own mental images. The same part of the brain that’s used for processing the images we see (the cortex) is also in play when we imagine something that’s not there. So if you want your audience to visualize something in a certain way, the best way to accomplish this is by illustrating it visually. So there’s no room for doubt. Think about this sentence: “A man sold his house.” Is there a conflict? Excitement? Now the same sentence, but with something else: “Sir Anthony sold his house to feed his child.” Now, we have a problem, a solution and an emotion, all in the same sentence. Finally, as with a movie, a presentation should start with what Hollywood calls the “Inciting Incident” – something happens in the life of the protagonist, early in the movie, that throws him/her off-balance, raising the need for a solution. You must use the same device to create a dynamic early on in your presentation and then provide a solution during the presentation. (1) A good PowerPoint with (2) a good Story. The result will be: More “Power” to your “Point”!